Tyres Assist supply and fit car and van brakes at unbeatable prices. Your brakes are the most important safety-critical system on your vehicle and it’s essential that they are inspected regularly to ensure they remain in perfect working order. We offer a FREE brake safety inspection. 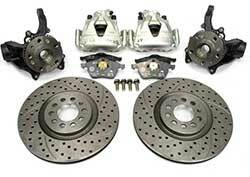 One of our experts will check the pads or shoes, discs, drums, calipers and brake fluid. Standard fitting service is available at our fitting centre. Mobile fitting will incur our standard £20 call-out fee. For further information, please call Tyres Assist on 0161 764 55 11.